Chelsea Building Society is a trading name of Yorkshire Building Society based in Bradford, West Yorkshire. Chelsea merged with The Yorkshire in 2010, at which point Chelsea was the fourth largest building society in the United Kingdom, with assets in excess of £13 billion. Chelsea has 35 branded branches, mainly in the southern areas of England with a large number of these in London. Chelsea now forms part of the Yorkshire Building Society Group, alongside Yorkshire Building Society, Norwich and Peterborough Building Society. In January 2016, Yorkshire Building Society announced that seven of the Chelsea's branches would close, with the remainder rebranded as Yorkshire. Chelsea was first established in 1875 as the London & Camberwell Building Society. Three years later, in 1878, the Borough of Chelsea Permanent Building Society was formed. Over the years both societies merged with smaller societies and on 31 December 1966 the two societies merged to create a new society with assets of £30 million. The new society was called the Chelsea and South London Building Society until April 1971 when the name was changed to Chelsea Building Society. It is a member of the Building Societies Association. Operating mainly in South East England with a network of 35 branches. Following the merger in 1966, the administrative headquarters were based in Streatham, with the registered office at 110 Kings Road, Chelsea. 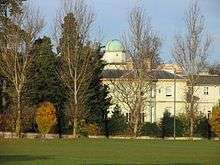 In 1973, having outgrown the accommodation at Streatham, the administrative headquarters moved to Thirlestaine Hall in Cheltenham. 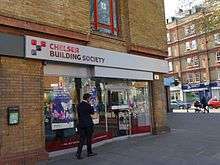 On 1 July 1988 Chelsea completed a merger with the City of London Building Society, with the name Chelsea remaining unaffected. In 2005 Chelsea opened a purpose built customer contact centre close to the Head Office at the old Charlton Kings railway station as a commitment to keep its call centres UK based, which won environmental awards for its use of geothermal heating, green building and "green" credentials. Its two head offices were based in Cheltenham employing over eight hundred staff. In February 2007 they acquired Britannia Capital Securities (BCS), a medium-sized independent firm of Secured Loan and Mortgage brokers operating in the UK, in order to further diversify their lending. The Society remained operational during the 2007 United Kingdom floods, despite having no running water for several weeks. On 7 June 2008 it was announced by both Catholic Building Society and Chelsea Building Society that they were to merge. On 10 October 2008, Chelsea revealed £55 million of its liquid assets (1.55%) were invested in the troubled Icelandic banks. Whilst the amount involved was only a small percentage of assets, it represented almost one year's operating profit for Chelsea. On 31 December 2008 the merger between Chelsea Building Society and Catholic Building Society completed. In August 2009 it was revealed the Chelsea had written off £41m in "potentially fraudulent loans", mainly from its Buy to Let mortgage book which had been underwritten between 2006-2008. Although it had made an underlying operational profit that year of £18m and the fraudulent loans did not necessarily equate to a £41m loss. A new temporary Chief Executive, Stuart Bernau, was appointed to fill the space left by former Chief Executive Richard Hornbrook in August 2009, and also to conduct a systematic review of Chelsea's future. The findings were announced to the press the week beginning 30 November 2009. On 1 December 2009, Chelsea announced being in advanced merger talks with Yorkshire Building Society. The following day they announced a formal merger. At a Special General Meeting in Bradford on 23 January 2010, Yorkshire Building Society members approved the merger proposal. The merger completed on 1 April 2010. Shortly afterwards, Yorkshire announced the closure of Chelsea's operational presence at the original Cheltenham Head Office in Thirlestaine Road by 2011, relocating the remaining staff to the second, smaller site at the old Charlton Kings railway station. The Thirlestaine Hall site was acquired in 2012 to build a gated housing estate and elderly Care Home known as Thirlestaine Park. Much of what Chelsea had constructed to accommodate its business needs was demolished and the Grade 2 listed Thirlestaine Hall building was converted into luxury flats, the Coper Dome Observatory remains today. 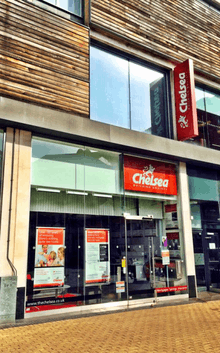 In January 2016, it was announced that seven of the Chelsea's branches will close by September, with the rest to be rebranded under the Yorkshire brand. Products and services under the Chelsea brand will continue to be available online and by telephone. ↑ Building Societies Association - Asset List (PDF) Archived 27 March 2009 at the Wayback Machine. ↑ Chelsea key facts and figures Archived 30 January 2010 at the Wayback Machine. ↑ Chelsea Press Release 7 June 2008 Archived 21 September 2008 at the Wayback Machine. ↑ Chelsea Press Release 10 October 2008 Archived 14 October 2008 at the Wayback Machine. ↑ "£41M Fraud Hits Building Society". BBC News. 21 August 2009. Retrieved 28 April 2010. ↑ Chelsea Press Release , August 2009 Archived 16 December 2009 at the Wayback Machine. ↑ "£41m fraud hits building society". BBC News. 21 August 2009. Retrieved 2010-01-24. ↑ "The Chelsea and Yorkshire building societies may merge". BBC News. 2009-12-01. Retrieved 2009-12-01. ↑ "Yorkshire and Chelsea building societies agree merger". BBC News. 2009-12-01. Retrieved 2009-12-01. ↑ "Chelsea Building Society merger approved". BBC News. 23 January 2010. Retrieved 2010-01-24. ↑ "Buyers snap up apartments at former Chelsea Building Society premises in Gloucestershire". South West Business. 9 August 2013. Retrieved 2014-04-10.